Minimum quantity for "Boutique, Cocktail, Majestic, Precious Pearl, Sirio & Stardream Single Creased Deckle Cards" is 5. 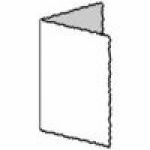 Minimum quantity for "Centura Pearlescent Single Creased Deckle Cards" is 5. Minimum quantity for "Irridescent Conqueror & Curious Single Creased Deckle Cards" is 5. All of these pearlescent cards are 300gsm apart from Antique Gold, Emerald and Mars which are 285gsm. All are double sided. Minimum quantity for "Metals Single Creased Deckle Cards" is 5.